M12 Connectors for Easy Assembly, No Tools Required. An M12 Extension Cable is Required for Installation. Our RTD sensors with M12 connections provide for easy and efficient installation or removal of these sensors for preriodic calibration, troubleshooting or replacement. Gone are the days of having to pull extension cables from cable trays in order to calibrate or replace the sensor, now you simply disconnect the sensor from the extension cable saving cost and downtime. The Series PR-21SL Spring Loaded RTD has been designed to provide our customers with a simple, effective way to adapt our M12 enabled RTD probes for use in thermowells. To insure the best possible performance, the PR-21SL RTD has a spring loading feature that maintains contact between the probe and thermowell under static and vibration conditions. This helps to maintain heat transfer between the thermowell and probe, as well as dampening the effect of vibration on the sensor. With a demonstrated ability to withstand 10gs of vibration between 10 and 500HZ (for 6" long and shorter probes per MIL-STD-202G, Method 204D, Test Condition A), this probe has shown its ability to withstand real-world conditions. To select the right length probe for your application, simply measure the depth of the bore in the thermowell (the length from the top of the thermowell to the bottom of the bore as shown as the “Thermowell Stem Length” in the sketch below). The PR-21SL sensor assembly is designed to fit into a thermowell with a stem length equal to that specified in the model number. Simply slide the sensor assembly into the thermowell until bottomed and then compress the spring while making the 1/2NPT connection. Thread sealant tape or thread compound may be used on the 1/2NPT mounting thread to insure easy removal at a later time. The position of the self-gripping spring can also be adjusted so that the sensor can be used in a shorter thermowell, simply twist the spring while sliding it along the probe stem until the needed position is reached. The PR-21SL can also be used as a back-up sensor for a variety of applications. The spring loading feature can be adjusted to fit a variety of thermowells. The spring loading fitting can be removed altogether and replaced with a compression type fitting if a fixed mounting is needed. The probe (less spring and hex fitting) can also be used with one of Omega's M12-Handle accessories to turn your spring loaded probe into a hand-held probe. This flexibility in mounting options, as well as the simplified and robust connection provided by the M12 connector, makes the PR-21SL the perfect solution for a wide variety of applications. These RTD sensors can be used in any 2, 3 or 4-wire application by selecting one of the two available wiring arrangements (see the wiring diagrams below) and using only those wires needed for your connection. This allows for simplified, trouble free installation with any existing application. This also allows the PR-21 series sensor to be used for a wide variety of replacement applications since it can be connected as-is with just about any measurement or control equipment available. When ordering your PR-21SL sensor, don't forget your extension cable. Omega offers a wide selection of extension cables including over molded PVC, LCP/PFA, Polyurethane and Silicone cables, as well as customized cables in a variety of cable materials with optional stainless steel braid or hose for improved mechanical protection. Omega also offers a selection of programmable and fixed range transmitters fitted with M12 connections, and a wide selection of controllers, panel meters and other instruments to complete your measurement needs. Connector: 4-Pin "A"-Coded M12 Plug Connector. Standard Probe Lengths: See Thermowell Stem Lengths in The Order Table Below. Sensor: Pt100 (100 Ohms at 0°C, .00385 TCR (alpha)) Standard, Pt1000 and Other Options Available. Accuracy: Class A Standard (per IEC 60751), Others Available Upon Request. Temperature Range: -50 to 250°C Except for the Connector Which is 85°C Max. Vibration Resistance: 10gs from 10-500Hz per MIL-STD-202G, Method 204D, Test Condition A. Spring Loaded RTD Sensor to Fit Thermowells with a Stem Length of 2.5" or Less. Spring Loaded RTD Sensor to Fit Thermowells with a Stem Length of 4" or Less. Spring Loaded RTD Sensor to Fit Thermowells with a Stem Length of 6" or Less. Spring Loaded RTD Sensor to Fit Thermowells with a Stem Length of 9" or Less. Spring Loaded RTD Sensor to Fit Thermowells with a Stem Length of 12" or Less. 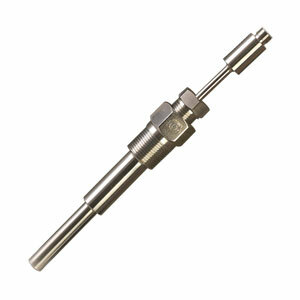 Spring Loaded RTD Sensor to Fit Thermowells with a Stem Length of 15" or Less. Spring Loaded RTD Sensor to Fit Thermowells with a Stem Length of 18" or Less. Spring Loaded RTD Sensor to Fit Thermowells with a Stem Length of 24" or Less. 304SS Thermowell, 1/2NPT Mounting Thread, Stem Length 4"
304SS Thermowell, 1/2NPT Mounting Thread, Stem Length 6"
304SS Thermowell, 1/2NPT Mounting Thread, Stem Length 9"
304SS Thermowell, 1/2NPT Mounting Thread, Stem Length 12"
For the alternate wiring arriangement (see Wiring Figure Above), change "-1" at the end of the model number to "-2" at the same price. For a probe length not listed up to 24", change the stem length in the model number to the required stem length (example: 1250 = 12-1/2") and use the price from the next longer sensor.